Anyway, on to the cookie. The original recipe calls for margarine, which I never have in my house, so I used butter. Also, I swapped out half of the regular sugar for brown sugar as I wanted a slightly chewier cookie, and I’m happy with the texture. And although the title of the original recipe calls them spicy, they aren’t. In fact, they’re just right and oh so delicious! If you’re looking for photos of the process, sorry, there aren’t any. This recipe has molasses in it, and as we know, I hate the smell of molasses and had to work super fast and not take pictures as to not gag for longer than I had to. Seriously, it’s that gross. In a large bowl, cream together the butter and sugars until smooth. Stir in molasses and egg yolk. Combine the flour, salt, baking powder, baking soda, cinnamon, cloves, ginger, and nutmeg; blend into the molasses mixture until smooth. Cover, and chill for at least one hour. 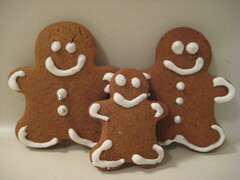 I want to make them in the worst way and no one in my house likes gingerbread! whenever a dessert recipe calls for sugar AND molasses, i try to substitute them with muscovado sugar instead. I just made gingerbread over the weekend but I used a recipe that used butterscotch pudding instead of molasses and they were great. I didn’t think my son would like traditional spicy gingerbread (and well, it’s not my favorite either). I hate the smell of molasses too! and the taste by itself. but i dont mind it in cookies, cakes, etc. Given how much you hate molasses, I’m amazed you were able to muster smiles on those faces :). I love making gingerbread people – just because they’re fun. Cute gingerbread men! Happy New Year! Yipee for the Gingerbread Men. I love them because they are so cute. I made them as well this year. Fun! @LA Lola – Its has a burned kind of smell. You either like it or not, theres no in between 🙂 Its very sweet but it has a burned caramel taste, but its unique.